Just ahead of the the 2 Guns movie, Boom is releasing a sequel to the comic series that the movie is based on. The story picks up again with the two undercover agents, Bobby and Marcus. But, this time it appears there is a third. Bobby Beans is kidnapped a by a militia who wants him to steal some guns for them. Thing is, Bobby Bean is actually Bobby Trench, an undercover agent. While spying on his target, Bobby notices that Marcus, an old associate and the person who knows that Bobby Beans and Bobby Trench are the same person is also part of the setup. After the two come to terms and come to an agreement, the reader is shown that there is another player in the mix. 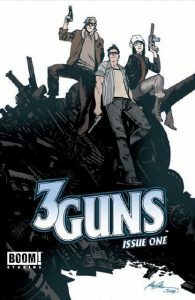 Steven Grant has worked in comics for years and has an impressive resume, but I can’t help but feel that 3 Guns isn’t a great accomplishment. It seemed oddly paced at points and a reader who hasn’t read the previous miniseries, like myself, is left feeling a bit confused. That being said, the art by Emilio Laiso gives the book a great look and saves it from being overly mediocre. New readers may want to pick up the first series before jumping into this one. Or, just watch the movie when it comes out this week. Either way, a bit of background information is definitely helpful. Things like gravity seems entirely unchangeable, laws that will forever be in effect. But what if they suddenly and randomly stopped working? This is the idea behind Collider. In a world where gravity has to be welded back together, given the right conditions, the impossible is always possible. With the laws of physics randomly becoming void, a special task force is created: The Federal Bureau of Physics. The FBP deals with the times when gravity suddenly stops working and fixes those problems. One FBP agent is Adam Hardy, son of one of the people who first looked into the physics anomalies. After a bad mission, Adam is left injured and nearly killed, and with the knowledge that there might be another dimension encroaching upon his own. 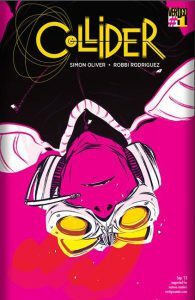 Simon Oliver and Robbi Rodriguez makes a very enjoyable and original story. The idea that scientific anomalies have become so commonplace that there is an agency specifically to fix them is interesting. As is the idea that the laws of physics are unraveling. The art is fantastic with great colors, making the story very visually appealing. This is a great book for lovers of sci-fi to dive into comics with. It’s full of great sci-fi elements and great plot, plus has some sweet art. New readers can’t go wrong by picking up this book. Parental Concern: Mild. Some language. After the events of Age of Ultron, time is in shambles. People and places are starting to disappear and there is only one being powerful enough to fix it: the Indestructible Hulk. After an airport disappears on one of Hulk’s mission, Maria Hill takes Bruce Banner to the secret S.H.I.E.L.D. division T.I.M.E. which is looking into all the time anomalies. 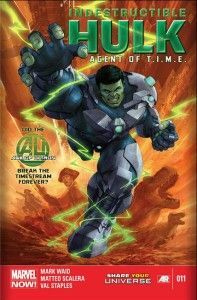 With a bit of help from a man claiming to be from the 23rd century, Hill and Bruce Banner decide that Hulk is the only one capable of surviving what has to be done to fix time, and Bruce Banner has to lead him there. Mark Waid continues to write an incredibly original Hulk run and one that takes the character in new directions. No longer is Hulk a time bomb, waiting for the next accidental explosion. Now, he’s a force of good, using his power to stop crimes and using Banner’s intellect to save the world. Artist Matteo Scalera makes this issue stand out with a style that wouldn’t normally be associated with Hulk. Another cool thing about the book was Scalera’s various depictions of Bruce and Maria in different time periods. New readers can get into this book. Waid once again delivers exposition in a way that fits well into the story, making it part of the story rather than a summary. Jim Albright was one of America’s most brilliant minds during World War II. Though he was barred from enlisting in the military because of his intellectual importance, he found a way to fight the Nazis as Captain Midnight a mysterious hero who always seemed to help the Allies when they needed it the most. But in 1944 he disappeared, only to return in the present day. News of Captain Midnight’s return has spread to various government agencies and also to his former sidekicks. The granddaughter of his former sidekick looks for Midnight at his former secret base, only to be met there by her ex-husband and federal agents. Both look for Captain Midnight, only finding him after some of his former enemies show their hand. 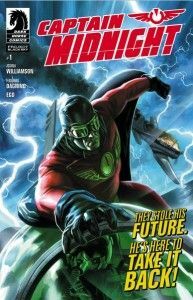 The story is interesting, combining pulp whimsy with a decidedly fatalistic hero in Captain Midnight. Dark Horse’s move to revive old heroes is good, since even with an abundance of heroes it’s always good to have more that can be played with freely. Joshua Williamson’s writing is believable in the way that the characters interact with one and features genuine sounding dialogue. The art by Fernando Dagnino gives a polished look to the book and portrays the action of the story very well. New readers can jump right in. It’s a superhero story outside of the normal fare with a bit more believable supporting cast. All in all, it’s a solid issue. Captain Midnight was a really good read. The art and writing were fantastic. The LCS I stopped by yesterday didn’t have Collder #1, but I’m hoping to pick that up today as well!